Metro-Manila: The roughly 100 percent fare increases imposed on users of the Light Rail Transit 1 and 2 and Metro Rail Transit 3 is a great disservice to the riding public. The problem does not lie only in the lack of substantive public consultations, not only in the fact that the increases are taking place against a background of poor service and alarming accidents, not only in the one-time imposition of a massive hike in favor of staggered hikes. The fare hikes have been imposed mainly in order to meet the government’s obligations to assure the profitability of the metropolitan rail system for the private contractors it has picked to operate the system. Consortium and to pay off the15 percent total return on investment guaranteed by the Philippine government to the MRTC for the period 2000-2025. While performing its contractual obligations to private sector players, the government is not living up to its social contract to provide inexpensive, adequate, and safe public services for the population of the country’s biggest and most important metropolitan region. 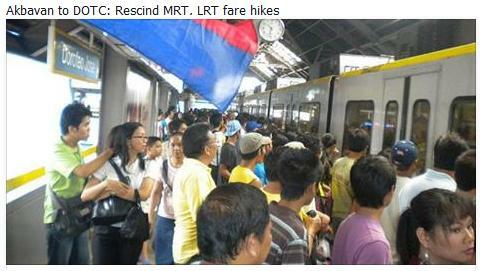 Most of the riders of the LRT and MRT are struggling people with middle and low incomes. With inflation eating at their incomes and some 26-28 per cent of people remaining under the poverty line, the 100 per cent fare increase will mean less to spend for food and shelter for the average urban family. Public services in a country where a large part of the users are poor must not be operated under the neoliberal principles of privatization and full cost recovery propagated by the Asian Development Bank and the World Bank, two institutions that have played an influential role in determining the fiscal policies of the government. Privatization has been shown to be a failure in almost all areas where it has been implemented, being marked by escalating rates and increasing monopolization, along with inefficient service delivery. Prior to the neoliberal ideological takeover of government, subsidization of public services was seen as a government’s duty to its poor and marginalized citizens, one that was paid for through transfer payments drawn from taxes imposed on the richer sectors of the population. This is a widely accepted and legitimate principle and practice that the Aquino administration must return to and uphold. For Department of Transportation and Communications Secretary Joseph Emilio Abaya to rail against the costs of subsidization of the public is misplaced. Perhaps he should be faulting the Bureau of Internal Revenue for being ineffective in collecting taxes from the rich and the Department of the Budget for the wrong priorities in budgetary management. With tax revenues coming to only 15-17 per cent of GDP—the lowest in Southeast Asia—we urgently need reform in the formulation, legislation, and implementation of tax policies. To be fair, the inability to collect income and wealth taxes from the rich did not begin with the Aquino administration. It is, however, this administration’s duty to improve its tax collection capabilities and reverse a longstanding trend, as it promised early on in its tenure, rather than have an increasing burden of necessary public service expendituresfall on the struggling middle class and the poor, who are already reeling from sales taxes, expanded VAT, and other indirect taxes. The government should be subsidizing the public, not private consortia like the Indonesian-controlled Pangilinan Group. The government should be placing its effort in increasing revenues from the rich to pay for public services, not squeezing the riding public. This representation urges the Department of Transportation and Communication to rescind the fare increases for riders of LRT 1 and 2 and MRT 3. The government must penalize the private contractors who messed up the operation of the MRT system instead of running after the meager income of workers who use the metro rail system regularly. Labor groups under the coalition Nagkaisa! made this call as they kicked off the first working day of the year with protest actions against the MRT and LRT fare hike implemented by the Department of Transportation and Communication (DOTC) last Sunday. He added that an ordinary worker who use the MRT will have to shell out at least P8,000 to cover the rate increase of 87% (from P15-P28) in one year. Total annual cost of the adjusted MRT rate will be at least P17,000. On his part, Josua Mata, Secretary General of Sentro ng mga Nagkakaisa at Progresibong Manggagawa (SENTRO) who led the protest action together with Public Services Labor Conferederation (PSLINK), PM and other members of Nagkaisa! at MRT’s North Avenue station, said the government should finally rescind the contract and take over the operation of the entire system so that the concept of ‘subsidy’ does not become a misnomer anymore for the take-or-pay contract. He noted that the fare hike is not meant for service upgrade but for debt payments to a private concessionaire. 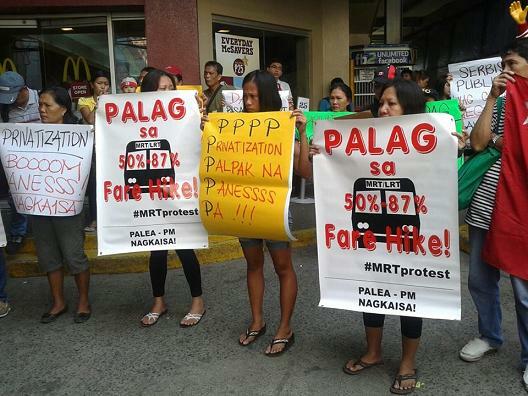 The Bukluran ng Manggagawang Pilipino (BMP) which led the protest action at MRT-Cubao station likewise believes that the fare hike is the bitter fruit of a failed privatization program of the country’s mass transport system. Nagkaisa! vowed to conduct more protest actions this month against the fare hike. Labor groups under the coalition Nagkaisa! are set to welcome the first working day of 2015 with a protest against what they consider as government’s assault on workers’ living condition – the implementation of fare hikes in the MRT and LRT system. The Department of Transportation and Communication (DOTC) proceeded with the implementation of the rate hike yesterday, amid oppositions from labor, commuter groups and legislators. Based on surveys, lowly-paid workers and students make up the bulk of regular train riders. 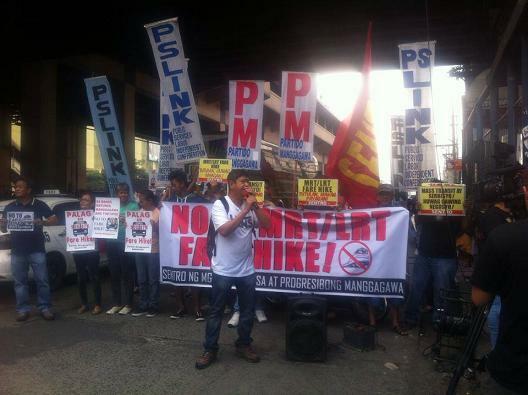 Members of Partido Manggagawa (PM), Philippine Airlines Employees Association (PALEA) and The Federation of Free Workers (FFW) will be leading the protest at the MRT Pasay-Taft station while the Sentro ng Nagkakaisang Manggagawa (SENTRO), Public Sevices Labor Independent Confederation (PSLINK), PM and other members of Nagkaisa are taking the MRT North Avenue station. The Bukluran ng Manggagawang Pilipino (BMP) is taking the Cubao station. Aside from the mass action, Nagkaisa! will be distributing leaflets explaining why commuters should reject the fire hike and how they can express their protest. “The fare hike is the first oppressive policy of the year, the first assault by government on workers’ living condition. Workers were first to pay their taxes but they were also the first to carry the burden of budget cuts and other unjust policies by government,” said PM spokesman Wilson Fortaleza. On his part PALEA President Gerry Rivera, lamented that while fares in other modes of transportation, including airlines, are dropping significantly because of the sharp drop in oil prices, but fares in the MRT and LRT are rising by as much as 87%. The Nagkaisa in a series of dialogues with the President has called for a cost-effective and efficient mass transport system since the heavy traffic has been eating up a lot of productive hours of workers. “The Aquino administration has not only failed to address the traffic mess, it is shamelessly adding a three-fold burden to workers who will have to shell out more for their own train fare and that of their children who go to school,” said Julius Cainglet of the Federation of Free Workers (FFW). 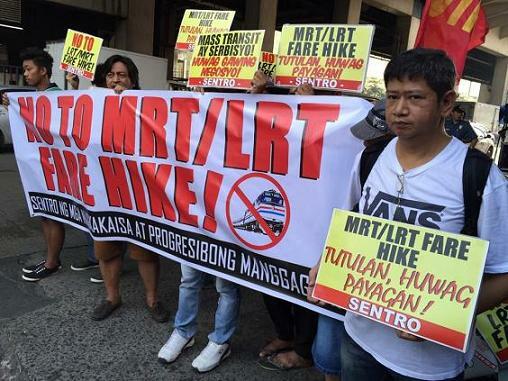 Increasing the fares in the metro railway system more than half from current rates is totally unjust and the most insensitive year-ender policy declaration by the Aquino administration, the labor group Partido Manggagawa (PM) said in a statement. “Most of train riders are ordinary workers who pay P15 or P20 for every violent ride in our present railway system. A fare increase will add more to this violence,” said PM spokesman Wilson Fortaleza. Fortaleza explained that a fare increase, particularly in MRT3, would neither mean comfort nor improvement in services as more than 70% of its finances goes to equity rental to MRTC, its original private concessionaire. As per announcement made by the Department of Transportation and Communications (DOTC), the fare matrix in the three systems shall be adjusted beginning January 4, 2015. These will include 87% hike (from P15-P28) for MRT 3; 67% (from P15-P24) for LRT 2; and 50% (from P29-P30) for LRT 1. PM together with other groups under the labor coalition Nagkaisa will be planning mass actions to oppose the scheduled fare hikes. Fortaleza said based on a previous study, 67.7% of regular train commuters earned monthly income of less than P10,000 or less than the minimum wage; some 15% are without income (probably students); while only 1.4% are with income of P30,000. § The fare hike is due to the removal of subsidy and not for the comfort of the riding public. § It is a huge burden to commuters, most of whom are ordinary workers who receive starvation wages. § The increase is for rental payments to an onerous original contract and an incentive to prospective private concessionaires under the public-private partnership or PPP program. § That less subsidy means funds for other services is a pale, fallacious argument. The group argued that in most countries worldwide the railway system, which is the most efficient mass transport system, is heavily subsidized. In its position paper submitted to the DOTC during its previous consultations, PM believes that subsidy is not a bad thing if it is in pursuit of social objective. The government should even invest more money to save and develop the country’s crumbling mass transport system. “To us, subsidizing at least 500 million rides of workers a year is more productive than subsidizing the comfortable travel of 500 VIPs in government,” said Fortaleza, adding that all taxpayers pay for at least P8-billion a year of travel subsidy for our public officials. The group, which opposes the privatization of the railway system, likewise believe that the fare adjustments were meant as a major incentive for private players who demand highly competitive pricing to be in place before they actually enter a PPP project.